Star Painting LLC is a division of Star Builders LLC, an award-winning home builder and remodeler with dozens of local awards to its credit. 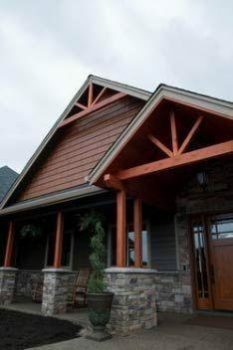 When you choose our expert exterior painters in Salem, OR, you’re choosing a company that puts its heart into every project. And our track record of success motivates us to continue building on that reputation. When painting a home or facility, technique matters as much as customer care. We believe that from the initial call to the final touch-ups, every detail matters. But we don’t let the details slow us down. Our process is streamlined so you know what to expect and when to expect it. When we start a project we customize the service to your needs. We work with you to color-match existing features, choose paint types, accent and trim colors, and to decide which areas need to be sanded or repaired before new paint is applied. Preparation is key when you want to avoid setbacks and additional costs. That’s why we use our experience to help you plan and prepare. 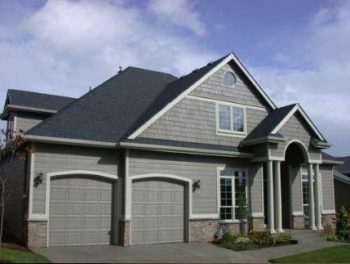 Exterior house painting isn’t something many homeowners do more than once in a lifetime. And it’s our job to make that ‘once in a lifetime’ experience a good one. Thorough protection of landscaping features, adjacent buildings, etc. At Star Painting, we do home improvement differently. Our clients aren’t sold a mediocre service and abandoned afterward. Likewise, our painters don’t deliver sub-standard services because they feel disconnected from the company. We work collaboratively and guide you through the process, leaving no questions unanswered. And our team stands behind their work because our individual values are aligned. In an increasingly fast-paced world where loyalty is hard to come by, this is a rare find. 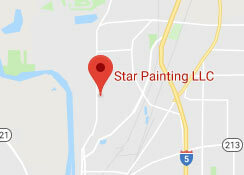 Star Painting is employee-based. This means that each of our crew members is supported by a great local company and our customers get quality service from a team they can count on again and again. Our showroom features a wide variety of paint swatches and inspiration photos to help you visualize the end result. If you’re interested in seeing a 3-D version of your home with a new color, our design services are available by request. If you’re already working with a designer, we’re happy to take your paint draws or samples and help you find exact color matches. Additionally, we work with you to keep you informed on the process. There’s nothing worse than imagining a project will be completed in one day only to discover it took one day just to remove the old paint. Our painters keep in direct contact with you to ensure that you’re aware of what’s to be done each day as well as how long it will take to complete the project. Call our office to schedule a consultation. We look forward to bringing our expertise to your next house painting project.